Earth shattering news out of Australia this week could have monumental effects on breast surgery, both reconstruction after breast cancer and enlargement for cosmetic reasons. The technique discovered in Australia is called Neopec. So far the process has only been performed in pigs and was so successful that human trials are scheduled too begin in early 2010. The pigs grew new breasts in 6 weeks. 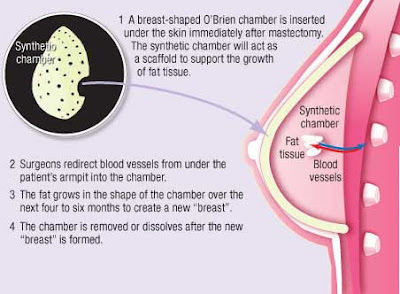 The surgeon places a scaffold or shell of biodegradable material in the breast, redirects a small blood vessel from the arm into the shell, places a small amount of the patient’s own fat inside the shell, and a dissolvable gel called Myogel is also placed in the shell. The Myogel and blood flow from the transferred artery stimulate the fat to grow until it fills the shell and therefore takes the shape of the shell. This is a direct finding from stem cell research. After that the biodegradable shell is dissolved by the body. In the future the shell may come with its own artificial blood vessel. If this all works out breast implants for cosmetic breast augmentation or breast reconstruction would become obsolete. Also this procedure is much less taxing on the patient than a transfer of fat with intact blood supply to the breast from the lower abdomen or other areas of the body. It could readily available for breast reconstruction within 3 years and for cosmetic breast augmentation within 10 years. The first few frames show the shells lying on the belly of a pig and the blue lines outline the blood vessels that will be redirected into the shells. The procedure will be called Neopec. The breast is scanned in order to obtain the measurements for the shell. The shell or chamber will be available within 3 days. The chamber is made of biodegradeable biocompatible synthetic material. The chamber is placed under the skin and a piece of armpit fat with its feeding artery intact is placed into the chamber. The fat grows to fill the dimensions of the chamber and the chamber dissolves over 3 or 4 months. It is a 2 hour surgery with a 2 day hospital stay. The donor site scar is much smaller than that for surgery using abdominal fat or back fat-muscle. The result is permanent as long as your weight is stable. Have they started recruiting for this trial yet? I could find nothing from 2011 on this. This treatment is not readily available in the United States as yet and I cannot find any ongoing clinical trials here.